Jackson is a scrappy player....reminds me of Matt Barnes. Last edited by dirt_dobber; 02-10-2019 at 05:10 PM. Damn Luka is fun to watch!!!!!!!!!! Looks like this game is going down to the wire. I'm wondering if THJ will look to take the last shot over Luka at the end of the game. I give it better than even odds that we'll get a chance to find out today. It would be nice if he could become that kind of player. Really looking forward to seeing how he develops. I like his energy, length and athleticism. DFS should stop trying to creat and move the ball when not open. How is that not a foul!! WTH does Luka have to do to get a foul call? It seems years ago when there was a 4 or 5 game stretch where Luka got 8+ foul shots per game. Last edited by turin; 02-10-2019 at 05:18 PM. Refs just hate Cuban. No other explanation to this crap where Doncic isn't getting these calls. Terrible shot by LUka. Come on. Wow, can't believe the refs swallowed their whistles. BUT WE DID IT ANYWAY! YES!!! Last edited by sefant77; 02-10-2019 at 05:23 PM. We play Trail Blazers really close towards the end of regulation it seems. I remember that overtime game all too well in which Luka tied it with that corner 3, running out of bounds. Why tank? Makes no sense. Gotta keep Kleber and DFS no matter what. I really noticed an uptick in energy on the court around the time Jackson came in. Maxi two outstanding defensive plays in the last two minutes. Oh and THJ and Matthews aren't anywhere near the same player. He might chuck up some poor choice threes, but otherwise, they play very differently. And why the hell Dirk just get two shots with 13min on the court?? Fun win. Luka sure has to learn to make plays late in the game and not just hero-balling. Kleber bailed him out like a pro. 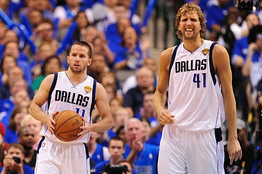 And unfortunately when Dirk went out. Yeah, I'm really liking the upgrade. KP might help out in that regard. A lot more to like from the game. Continue to like Brunson. Just plays smart. THJ will be fine when KP is back as 3rd or 4th option. Still need an athletic rebounding center who can finish lobs. And Luka is just tired... Lol. Just watched the last few seconds. Maxi made a phenomenal play, but DFS got torched on the drive, though in fairness to him it was Lillard. Edit: Initially misidentified Powell as player Lillard torched. Last edited by turin; 02-10-2019 at 05:47 PM.